Is The Problem in Your Relationship Actually Your Pride? When my husband and I got married I had a serious problem with pride. I knew it was there, but I didn’t realize how deep it was until we had an argument that almost ended our marriage. Up to that point, whenever we had a disagreement I would take it SUPER personal. I thought to myself, “I need to ignore him, give him the silent treatment, be petty and not cook him breakfast so he knows to never do that again.” It sounds ridiculous now when I write about it, but I actually still struggle with it from time to time when we’re upset with each other and I feel like I was justified. Then one day the silent treatment went on longer than it ever had before, like a couple of days of us being cold towards each other. When we finally sat down to talk about our issues, I wasn’t really listening. I just wanted to be heard. I told him in so many words that I didn’t care what he was struggling with or that it would take time for him to get things right-I wanted my way right then. I even hinted that I was willing to leave our marriage if he couldn’t get his act together. Things went downhill from there. He left for hours. I had no idea where he went. In the hours that he was gone, God showed me that I was creating the habit of choosing my pride over my love for my husband. I had become self-righteous and magnified his flaws mentally, while downplaying my own. When I did stuff to mess up and hurt or disappoint him, I found ways to minimize my guilt; but when Jono messed up, I quickly became offended and impatient. I wanted him to change to fit my preferences. That night, God showed me that my pride would cost me my marriage if I continued on that path. He showed me that I needed to be humble and be more patient with my husband’s flaws-especially if I was always minimizing my own. I broke down and asked God to forgive me. Yes, my husband was wrong for letting his temper get the better of him, but now I could also clearly see my part in the situation. I had let things between us fester for days trying to “punish” him, but no one won because our relationship suffered for it. That night I had to ask God to help me stop being so scared of being done wrong and just trust His hand to guide our marriage. I had to make up my mind that I was going to treat my husband with patience and compassion instead of waiting to pounce on the first mistake he made. Most of all, I had to accept that I was messed up too. My anger, pride, and impatience were real problems too. And I needed to put more energy into working on myself instead of trying to “train” my husband into becoming the man I thought he should be. A prideful person doesn’t see that they need to change. In fact, all the problems in the relationship are ultimately their partner’s fault.. In the mind of a prideful person, their spouse’s issues are a cross they have to bear, and they themselves are a martyr. So they constantly guilt, prod, criticize, or nag their partner into submission. They constantly find ways to blame their partner and make them feel like they need to change, but never acknowledge that they are messed up too. That kind of manipulation can cause your relationship to self-destruct. You’re putting yourself in God’s place in the relationship. You’re actually trying to force your spouse to change instead of working on yourself. This kind of strain can do serious damage to your partner’s self esteem. Imagine always being made to feel like you’re the most messed up person in the world? Imagine being made to feel like your flaws are bringing your partner down all the time? That kind of relationship can become emotional abuse. So if you find yourself always pointing the finger at your partner for the issues in your relationship, you probably have a problem with PRIDE. If you’re struggling with pride issues, you’re probably not spending much time working on yourself. Sure, there are things you’re willing to work on, but I’m talking about that deep, painful, uncomfortable stuff that you find hard to face. There’s no time to work on that stuff because you’re so focused on changing your partner and getting them to see things your way. Trying to bring a complaint or concern to a prideful person is hard because you feel like somehow they’re going to find a way to turn the problem back on you and make it your fault. You can’t get to the core of your relationship problems and actually work them out if your first response is to blame your partner. With that kind of dynamic, your partner will become more and more unhappy, until your marriage becomes a business arrangement. You will become two people co-existing, with all the affection and passion dried up because your partner will resent you. It’s hard to give advice on how to overcome pride because it’s not something you consciously decide to to do. It’s more of a mindset. And so working on pride issues require a mindset shift. Here are some things I had to start remembering every time my husband and I had conflict. 1. 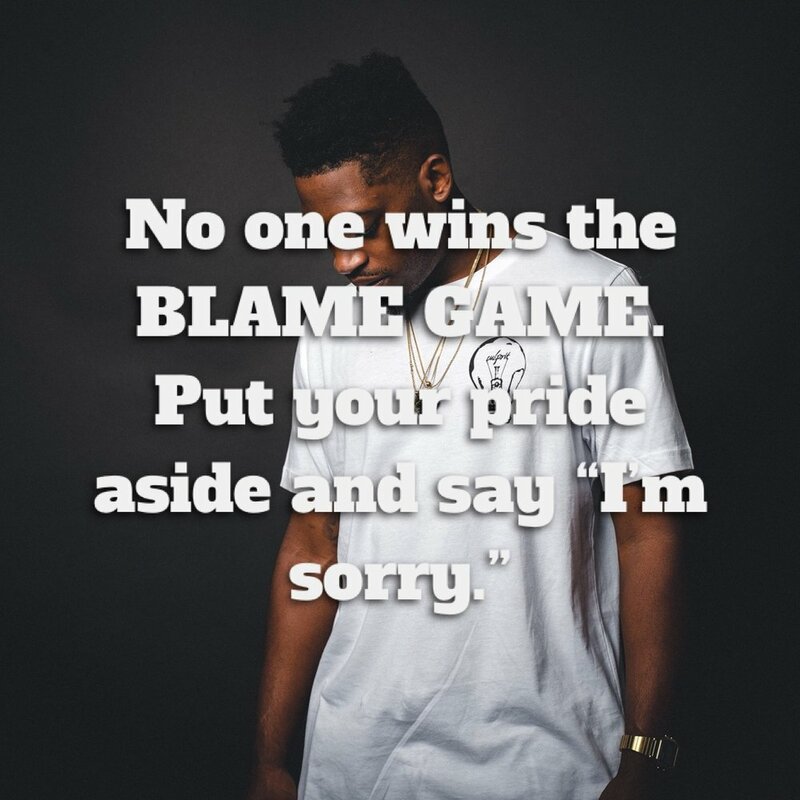 Avoid the the blame game. No one wins that game. All it does is create resentment and bitterness because each person is rubbing the other person’s shortcomings in their face. That’s not how God wants us to deal with our issues. 2. Always examine the part YOU played in the situation. Sometimes even when I felt like I was right and my husband was wrong, when I took time to think about it more I would realize that my reaction to his action caused things things to escalate. Looking at the part you played helps you be more honest with yourself. It helps you develop a more humbled, balanced view of you and your partner. If you always think of yourself as the wise, perfect one who’s trying to be patient with your lost, struggling spouse, you will never see the need for growth on your part. And your relationship can’t improve if you’re not trying to work on your issues and better yourself. 3. Look at your partner’s flaws with the same compassion and understanding that you look at yours with. It’s easy to downplay your own flaws and behaviors, because you know what you were thinking when you did them. You can find reasons to justify yourself and make your actions seem less wrong. On the other hand though, it’s harder to understand the motivations that drive your partner. That requires you to listen to their side and put yourself in your partner’s shoes. It requires you to look at them with the same love and compassion that God does. That’s what marriage is all about. It’s a continual practice of humbling yourself, listening, showing compassion, and forgiveness. It’s about learning to compromise, adjust, and put selfish preferences aside in order to build a stronger union between you and your partner, one that reflects God’s character. There’s no room for pride in love. One usually ends up destroying the other. Only one can win. What you now have to decide is this: Is being right more important than being unified? Is your pride worth your spouse? Are you willing to sacrifice your relationship for your ego? I hope you choose love! It never fails. If you’re reading to become the BEST version of you for your spouse (or future spouse), find out how you can join the Inside Out Love Challenge and experience MINDSET TRANSFORMATION for marriage! Get FREE resources in your inbox every week to to help you develop MARRIAGE MINDSET and GROW into the person your spouse needs! What If My Spouse Becomes Disconnected From God? In the past couple of years, I been pregnant twice and dealt with postpartum blues. For a long time, I was in a dark place. I felt like the words in the Bible were just bouncing off my brain. I would wake up to my toddler standing by my bed saying “Mama, I’m hungry,” roll out of bed, and start my day feeling irritated and wondering when I would be able to take a nap. Life felt so hard and it felt like I was on my own. At the same time, I was questioning a lot of religious traditions I had grown up doing, like church going and other stuff. Even now, I’m trying to decide what aspects of my faith I want to hold on to, and which ones I want to let go of. So I can definitely sympathize with anyone who feels this way. But what do you do when it’s your spouse going through it? What do you do when you feel like your spouse just isn’t in tune with God the way they used to be? After all, the Bible does say, “Can two walk together, except they be agreed?” Is it possible to still have a loving, Christ-centered marriage if your spouse is in a spritual funk? But there are certain things to keep in mind in order to make sure that happens. 1. People change, and so will their relationship with God. You’re not the same person you were when you first got married. Every year, you’re going through new experiences, learning new things, and developing. Traumatic things happen that shake our faith sometimes. So with all that going on, don’t expect your spouse to be the exact way they were when you first got together. When we first got together, I was super disciplined and consistent in my devotional life. I was waking up every morning at 5am to pray and journal. I was super involved at my church and I was super strict with my diet too. But as I got older, had kids, and went through the ups and downs of life, the way I related to God started to change. Through it all, Jono never once looked at me differently. He didn’t try to guilt me into a better relationship with God. He was always encouraging me to learn on my own. It’s so important to give them room to make mistakes and grow. Yes, you’re married to each other, but your walk with God is still an individual thing. So you may be on level of understanding and faith in your journey, and they might be on another. Give them time and space to grow at their own pace. 2. Focus on connecting, not religious rituals. I remember that I used to try to be so militant about my devotional time with Jono. We had to read a passage of Scripture or other spiritual book, talk about it, pray, sing, etc. But as time went by, our devotional time together started to look different. Nowadays, we pray together a few times a week, but every day we listen to a podcast together in the car and talk about it, or have pillow talk at the end of the day to catch up and share what’s been going on that day with one another. Be flexible about what your devotional time together looks like. If your spouse isn’t into reading the Bible right now, try doing something different together, like reading a personal development book, or listening to a podcast, or just going on a hike alone together and using part of that time to talk about your goals for the future. You can stay connected to each other in other ways besides praying together, trust me! Your marriage can stay healthy as long as you’re blocking off time to spend together doing something you both enjoy. 3. Become the middle man. Whether your spouse is wrestling with trauma they’ve experienced, or doubts about their faith, you can make a difference! You can intercede for them by praying for them even if they aren’t praying for themselves. Over and over in the Bible we have so many examples that intercession works. Not only do your prayers give room for God to work on your spouse, but it also changes YOU! Praying for your spouse will help you become more compassionate and understanding of their situation. Instead of feeling like putting on a facade for your sake, your spouse will feel supported and encouraged. Remember, the way you treat your spouse during this time can make your marriage stronger, or isolate you from each other even more. 4. Remember that God is in control. God created your spouse, so He loves them even more than you do! He knows what He’s doing, so don’t feel like your spouse’s salvation is riding on your shoulders. Give God room to work that part out. Here’s why taking the high road is ALWAYS worth it! Are Wives To Blame When Their Husbands Cheat? Is the cheating spouse the only one at fault?